I have extensively traveled throughout Colorado since moving here 10 years ago—from soaring the state’s 14,000-foot peaks to its gleaming lakes. 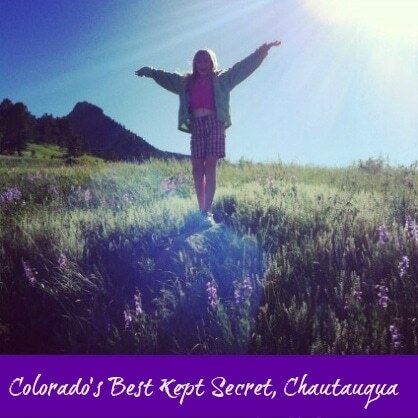 Through it all, one of my favorite destinations is just 20 minutes from my house: Chautauqua. Located at the base of the Flatiron mountains in Boulder, this National Historic Landmark has charming rental cottages that are surrounded on three sides with open space. Its 48 miles of hiking trails and thousands of acres of natural lands beg to be explored. I had been living in Colorado less than a year when I hiked Chautauqua’s Enchanted-Mesa Trail with my daughter and I was, well, enchanted. After my hike, I explored the grounds and was smitten by the newly-renovated Dining Hall’s throwback-to yesteryear patio (frequently rated the best outdoor dining in Colorado). 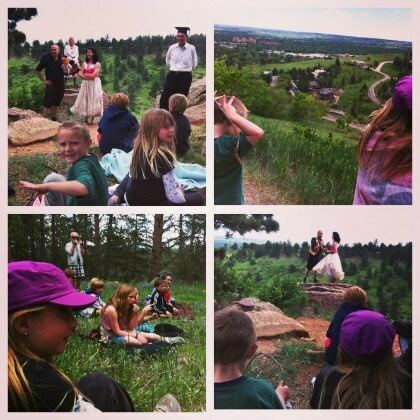 The historic Chautauqua Auditorium hosts films, lectures, Theatre-Hikes Colorado (this year’s production was Snow White with Dr. Jekyll and Mr. Hyde in the fall) and an entire concert series dedicated to children. Several years later, we finally did. I’m not a big history buff and have been known to fall asleep faster than a narcoleptic when watching the History Channel. But Chautauqua fascinates me. In the 1920s, almost 200 Chautauqua assemblies dotted rural America. Each summer, they brought culture in the form of concerts and classes in what became the country’s first mass experience with 30 million people in attendance. Colorado’s Chautauqua is one of the only remaining assemblies. This historic district has 60 cottages for rent, ranging in size from efficiency to a three-bedroom, each with a fully-equipped kitchen, as well as the eight-bedroom-and-bath Missions House Lodge. The cottages are unassuming on the outside but are quaintly restored on the inside. Don’t expect modern amenities like TVs or DVDs. With Chautauqua’s many activities, we did not even have time to acknowledge their absence. Our cottage backed up to the Bluebell Road trail. While I kicked back on the patio, the kids raced around the infusion of wildflowers in Chautauqua Meadow. Next, it was onto the hill-side slide at the playground. But the real delight was playing hide-and-seek in the network of trails in the adjacent grove. We basked in the midday sun and watched the flowers dance in the breeze at the Centennial Garden. We strolled down a lane of celery-green trees to the on-site Ranger’s Station and learned about Chautauqua’s wildlife. That evening, we played basketball and tennis at the courts behind our cottage. We ate on the Dining Hall’s outdoor patio, absorbing the dazzling views and fragrance of fine cuisine of the revamped menu. Who knew roasted Brussels sprouts with local honey, chile and lime could be so amazing? Prior to retiring for the evening, we watched the sun dip behind the Flatirons’ dramatic uplifts. 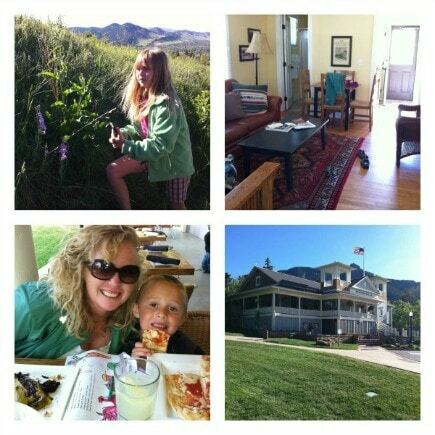 Chautauqua was a quick weekend getaway of beauty, bonding, amusement and appreciation. On second thought, maybe I should just keep it my little secret after all…. The Boulder Farmer’s Market on Saturdays. This isn’t just any farmer’s market—it is an outdoor extravaganza with a cornucopia of organic food, eccentricities, live entertainment and fun. My kids loved the booths (read: tasty samples), chatting with the farmers and the face-painting tent. Be sure to take a walk along the Boulder Creek Trail and take a short walk to Pearl Street Mall to shop, play in the spray fountains, eat and watch the street performers. For more information about Chautauqua, go to www.chautauqua.com. Thanks to them for hosting my family’s stay! What about Chautauqua appeals to you most? Let us know in the comments below! It sounds wonderful! It’s great to find a destination where the kids can be happy and have fun even without all the electronic distractions that they have at home – even if it’s only for a couple of days! Agreed, Lisa! And I love that it is still close to the city and all its amenities yet feels worlds away. Look forward to checking this out !